Codementor Support - How do I change my session rate? 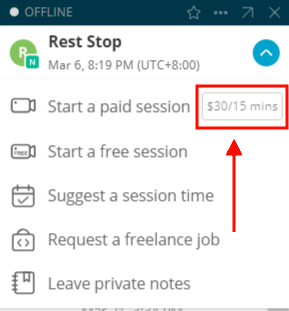 All Categories ​>​ I&apos;m a Mentor ​>​ Start a Session with a Client ​>​ How do I change my session rate? You can change your overall rate on the profile page. Go to your page and click "edit". You can also change your rate for a specific user through the drop-down menu in the chat box. How do I leave a review for my session? Can I edit the review?